The Nissan Leaf requires new thinking in two areas; horsepower and gas mileage. It excels in both but the numbers say it doesn’t. The Leaf has a 107 horsepower engine. That means, in the conventional wisdom, that the car is under-powered. Gas engines develop their maximum power late in the revolutions per minute cycle, usually two thirds of the way or later. That means you have to rev the engine to get the most power. Electric motors reach their maximum power immediately after the motor moves from dead still. For an electric motor, 107 horsepower is plenty to get off the line and into traffic. The Leaf posts a zero to 60 mph time of 7.1 seconds. The car weighs 3,300 pounds. Any other vehicle of that weight with 107 horsepower would be lumbering through the time trial at over ten seconds. 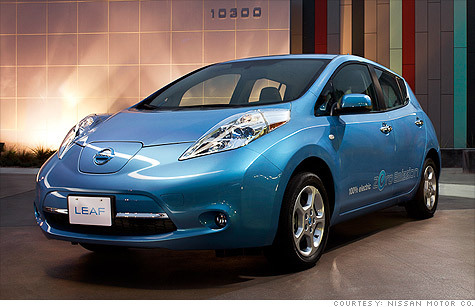 The Leaf gets 106 mpg in the city and 92 on the highway, and that’s misleading. Depending on the cost of electricity in your State, equivalent mileage could be as high as 199 city and 166 highway if you live in Idaho or as low as 50 and 43 for residents of Hawaii. Still, 50 equivalent miles per gallon in the city and 43 on the highway are very, very good. There’s a third angle to investigate when deciding to buy a Leaf. Will you like driving it? You’re not going to be constantly thinking about your equivalent miles per gallon when you drive the Leaf. You’ll be noticing the interior, the effectiveness of the climate control, the comfort of the seats. You’ll be aware of the spaciousness of the trunk. The Leaf shines in livability. The seats are heated. The controls are easy to use. The dashboard readout is pleasant to look at and easy to understand. The Leaf will haul 24 cubic feet of cargo with the rear seats folded down. There is plenty of room for all five passengers. The car handles very well with a low center of gravity and good steering. The Leaf comes in two versions; the SV and the SL. The SV is the base model and comes with LED headlights, Bluetooth connectivity and a rear spoiler. The SL includes all of the features on the SV and adds a quick charge port, rear-view monitor, a solar panel on the rear spoiler and a cargo cover. Both use the same motor and one speed transmission. Costs begin at $27,700.